Quigley's Cabinet: Build a better fogtrap? In remote areas regions of countries including Chile, Peru, Guatemala, Namibia, Eritrea, Oman, and Nepal, fog collection is a relatively cheap and environmentally friendly source of water. 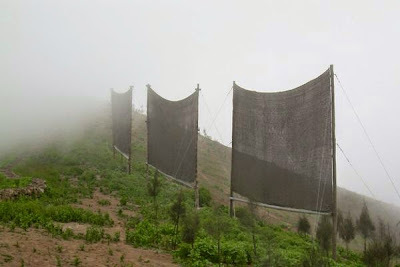 Standard fog collectors using mesh have been proven to be very efficient in parts of America's Big Sur by Daniel Fernandez, a fog researcher at California State University, Monterey Bay (LINK TO TED TALK HERE). Another scientist, doctoral student Xin Heng at the University of Texas at Arlington, Is working on a new design based on a bird's beak. But climatologist Otto Klemm of the University of Münster, who has been interested in fog for the past 30 years, points out that innovation in this instance has some disadvantages. A solid apparatus may not be able to withstand the strong winds that mesh can. In addition, they may be more expensive and harder to maintain in remote regions. As he puts it, "The more engineering there is, the less is the chance that these will be applicable for poor people in semi-desert regions."